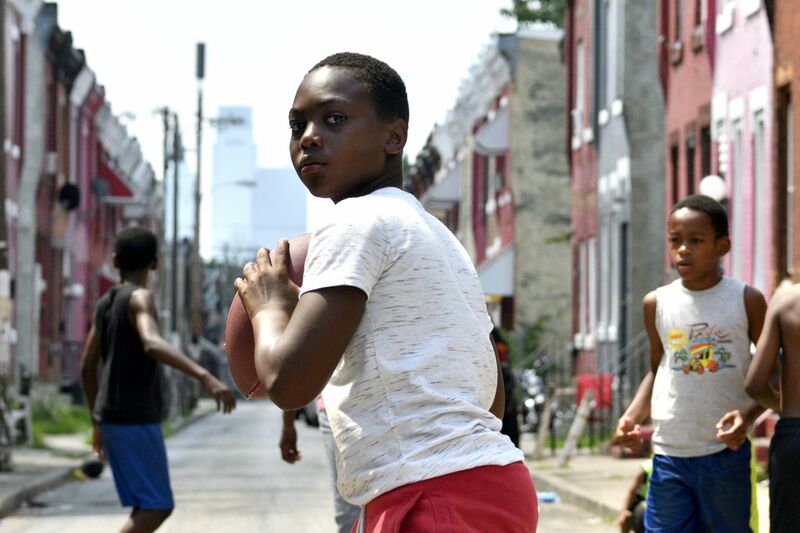 Nyzir, 10, prepares to throw the ball as neighborhood children play on the closed 2400 block of N. Bouvier Street, in North Philadelphia, PA, on August 7, 2018. Regetta Hinton sets up shop outside of her home just before 10 a.m. every summer weekday. Once the foldable table is locked in place and the lunch and drink coolers are full of ice, Hinton sits in her lawn chair and for the next six hours doesn't take her eyes off the children playing on the 2400 block of North Bouvier Street. A thin white cord cuts across the north end of the block that intersects with North Cumberland, with a small handwritten cardboard sign hanging in the middle: "Play Street." A small cardboard sign on the north side of the 2400 block of North Bouvier Street last week. Just on the other side of the makeshift divider is an underbelly world: drug dealers hanging on the corners, their customers snorting, injecting and smoking substances just feet away from playing children. "This is a drug-infested neighborhood," Hinton said, later adding: "I try to keep them further away from the end. They can see more and I try to not let them see much." Instead, she makes sure the 30 children who come to her North Philadelphia street during the summer stick to football and other healthy games right in front of her as part of Playstreets, a Philadelphia Parks and Recreation Department program. It is as simple today as it was when it started 50 years ago: One-way streets such as Bouvier throughout the city are closed to traffic on summer weekdays between 10 a.m. and 4 p.m. so children can play. In addition, the city delivers lunch and snacks to every participating street as a continuation of the free school lunch program. This summer, the city has 410 Playstreets. Some years there have been as many as 800. It's usually word of mouth from block supervisors that gets others involved. The application process is like having a block party— one to last all summer. The majority of residents on the block have to sign a petition agreeing they want Playstreets. Then someone on the block has to commit to being there every day to distribute lunches and snacks and be a contact for city and state monitors. The program is open to any block but no one in Center City or other relatively affluent neighborhoods signed up this year. "Those parents can afford the funding to send their kids to summer camp for a couple hundred dollars a week," Parks and Recreation Commissioner Kathryn Ott Lovell said. The median income in the 19132 zip code that includes Hinton's block is $22,316, according to the 2012-2016 five-year census survey. More than 37 percent of its residents live below the federal poverty level. Philly Playstreets was created for children who would otherwise be home all day without the means to get to a recreation center or summer camp. At the start of the summer, Parks and Rec staff drop off two coolers, footballs, a basketball, sidewalk chalk and other toys to each participating block. Some blocks add inflatable pools and other extras. Of course, the free meal is a big reason many poor neighborhoods do it. Neighborhood children take a break from playing football on North Bouvier Street. Lovell said Playstreets, which comes out of the slides and swings department, is "a massive undertaking" and tied to the $4 million program that provides free meals during the summer to 20,000 children at 680 locations. The cost is reimbursed through the state education department with money from the federal government. Hinton, 59, signed up for Playstreets about five years ago. She had just retired from her housekeeping job at Cooper Hospital and could supervise Playstreet. The city approved. Regetta Hinton lives on the 2400 block of North Bouvier Street in North Philadelphia and oversees the Playstreet program on her block. "This is the best Playstreet in the whole city!" Tyler Brown, 11, exclaimed. Zyhir Williams, 11, lives one block over on 18th Street and has his pick of a few other Playstreets in the area but he likes coming to North Bouvier. "We all family here," he said. Hinton is not one to, as she says, "babyfy" the kids on the block. She yells all day for them to either keep playing, to include younger kids in the games, or get up if they fall down. When Selassin Jones, 12, landed on the sidewalk trying to catch a football, he stayed on the ground holding his elbow. "Come on, get up, get up. You alright!" Hinton yells at the top of her lungs, her usual volume. The rest of the boys clap, encouraging Jones to get up. Once he does, Hinton asks Jones, who is her nephew, to go inside and get her first-aid kit. He does and she cleans up his elbow wound. Jones goes back to the game. The boys play for hours in the blistering sun with boundless energy. The Comcast towers and One Liberty shine brightly three miles south of Bouvier. Sometimes, the kids will take breaks to check their cell phones before Aunt Getta yells at them to keep tossing a ball. Hinton sits most of the time with earbuds hanging around her ears in case she gets a call or wants to order lunch for herself. The other day she was craving tilapia. When the mail carrier handed an envelope to Hinton, she joked that she only ever gets bills. "Why can't you say I got none?" she said, laughing. Then she calls over her nephew. "OK, Seventh Grader," Hinton said, giving him the big envelope with news he passed sixth grade at Young Scholars Charter School. "Go tell your mom. You're a seventh grader." Jones gives a little jump with a "yes!" and runs into the house to tell his mother. The hand of a neighbor reaches for grapes in the supplied lunch of Ty’meir, 10, during a break on North Bouvier Street last week. At noon, one of the kids yells "Lunch time!" Hinton gives each child a lunch pack from the cooler she has been guarding. Last Tuesday lunch was bologna and cheese sandwich on a multigrain roll with fresh grapes and baby carrots. Milk or juice were the drink options. At 3 p.m. they got a snack. This time it was yogurt and juice; other times it's been cookies. Playstreets has created tight bonds among the kids on the 2400 block of North Bouvier, especially as they get older and scatter to different schools. "There are people who have known me for years on this block. I have so many memories," said Tyler Brown, who will return to Boys Latin Charter School in the fall. Once Playstreet ends at 4 p.m., some of the boys go off to football league practices, either to the Blackhawks or the Sharks. Brown had just made the Blackhawks the day before. He would join Jones, his best friend, on that team. Then it's back to play on 2400 North Bouvier the next morning. Until school starts.